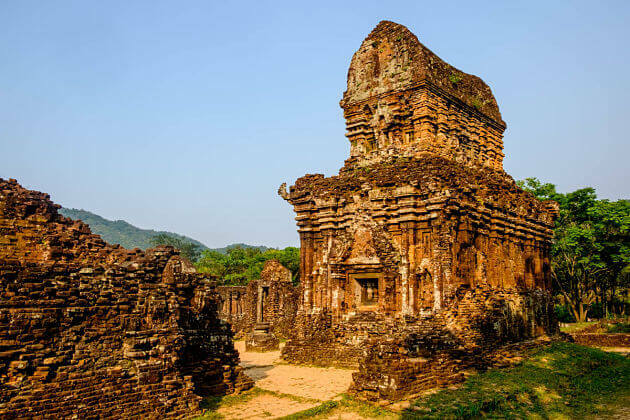 Located on the central coast in Quang Nam province, 30 km away from Tien Sa port, Hoi An shore excursions & Da Nang day trips from cruise port are two of the most popular choices that you should visit in any Vietnam shore excursion. With favorable geography and climate, Hoi An was once a bustling international trading port for merchant ships from Japan, China, and the West during the 17th and 18th Centuries. During the two wars, Hoi An luckily escaped devastation and consequently also the rapid urbanization of the late 20th century. Hoi An shore excursions introduce a place of many cultures that are expressed in architecture as assembly halls, temples with traces of Chinese heritage together with the traditional houses of the Vietnamese, and houses built by the French in their own style. The best time to visit Da Nang & Hoi An shore excursions is ideally from February to April when the weather is predominantly fine. You should avoid visiting Hoi An in the summer due to hot and humid weather. 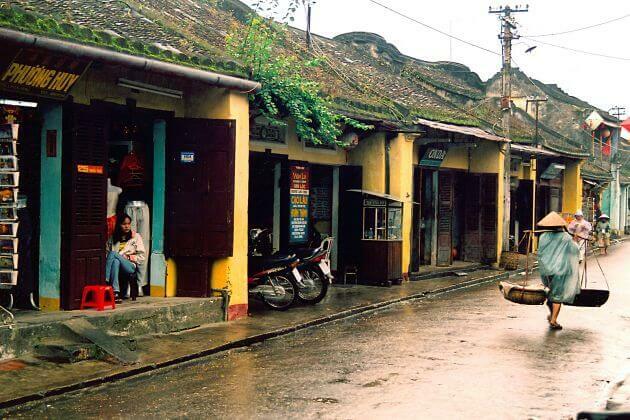 The rainy season in Hoi An is from October to November when heavy rain frequently falls, and flooding sometimes occurs. If you are lucky or have enough time, you should arrange to enjoy Hoi An day trips from cruise port on the full moon, when the atmosphere of the glittering lantern festival engulfs the city of Hoi An. Asia Shore Excursions offers various options of Da Nang day trips & Hoi An Shore Excursions for cruise ship passengers at Tien Sa cruise port. Do not miss out on the best Hoi An shore excursions from Da Nang city. Contact us for itineraries or to customize a unique sightseeing shore excursion in Da Nang and Hoi An that exclusively for you. Me and my wife we arrive on 29th. October to Chan May in a cruise. 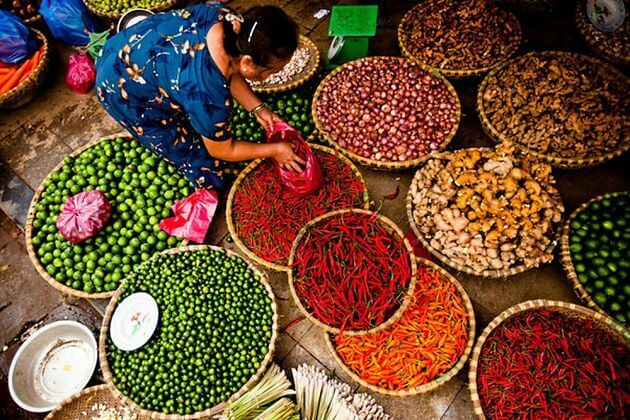 What’s the price of a private tour to Hoi AN? Thank you for contacting us! Please check your email for detailed quotation of Hoi An shore excursion. Kindly let us know if you have any other questions. Thank you for your request. Please check your email for detailed quotation of Kyoto shore excursion of this Hoi An shore trip. Feel free to contact us should you have other enquiries. 17th November 2016 could you tell me the price of VSC05 tour, we are quite happy to join a small group, thank you. Thank you for your request on Hoi An shore excursion. Please check your email for detailed quotation and let me know if you have any other questions. we (4 people) arrive on 13th january 2017 with the Ms Volendam in Da Nang at 7.00 am, we would like to know the price of the Hoi An Ancient town tour, code VSC05. What is the duration of this tour ? Our boot leaves at 5.00 Pm. Thanks for your request on Hoi An shore excursion, we have dropped you the detailed quotation, please check your email. Thank you for your request. Please check your email for detailed quotation of Hoi An shore excursion. Feel free to contact us should you have other enquiries. We arrive at Chan May Port 19/04 on Ovation of the seas, and would like to join one day tour to Hoi An pick up/return from the ship. Thank you for letting us know your travel plan. The detailed quotation for Hoi An shore excursion has already been sent to your email address. Kindly have a look at it and feel free to ask us any other questions. Thanks for your request on Hoi An shore excursions. Please check your email for the detailed quotation, and ask us any other question. We, a group of 4, will arrive on 26th March 2019 by Royal Carribean to Chan May, Danang. What’s the price of a private tour to Hoi AN Ancient Town? Thanks for your request on Hoi An shore excursions. Please check your email for the detailed quotation and ask us any other question you still have. Being translated as “opening of a large river”, Da Nang is located on the coast of the South China Sea at the mouth of the Han River – an ideal position which is just within 100 km of various UNESCO World Heritage Sites such as the Imperial City of Hue, the Old Town of Hoi An and the My Son ruins and so on including in Hoi An & Da Nang shore excursions. Moreover, Lady Buddha, Han River Bridge, My Khe beach and many many more destinations make Da Nang is a must-visit city in any Vietnam shore excursions. Da Nang is one of Vietnam’s most important port cities, so there is no reason makes you go Hoi An shore excursions first and then come back to start your Da Nang shore excursions. Being a UNESCO World Heritage Site, Hoi An is famous worldwide even from the meaning of its name “peaceful meeting place”. Hoi An architecture is the most significant feature makes everyone remember most about this city. Why? Because it is special – the mix of Vietnamese, Japanese, Chinese and French architecture. 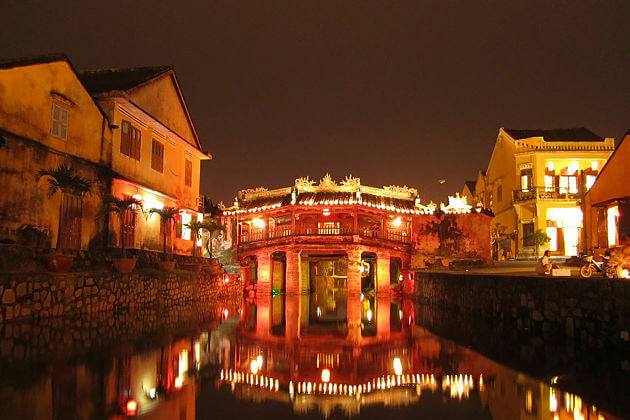 Can you find another town where have both Japanese bridges – the symbol of Hoi An and the Old Quarter of Hoi An in a small city with 60 km2 and 120,000 citizens? Moreover, 30km is the distance between those two makes the Hoi An shore excursions from Tien Sa cruise port in Da Nang city is the most popular one. To help tourists in preparing for their Da Nang day trips & Hoi An shore excursions, a specific list of things to do and see in both city will be mentioned below as a reference for tourists to choose the most suitable tours for you. Going to the religious areas such as pagodas, church and so on is the best way to find out which religions the local people are following. With the tourists who care about religions as well as want to immerse themselves in a religious atmosphere, Linh Ung Pagoda is highly recommended for cruisers from Da Nang shore excursions. Being located in the Son Tra Peninsula, the pagoda is considered as the largest pagoda in Da Nang City for both scale and art of architecture. Even though the architecture of the pagoda itself is attracted tourists – a contemporary style combined with an inherent tradition of pagodas in Vietnam; the 18 stone statues of the 18 Arhats and especially the Guanyin statue, in fact, make the pagoda even more popular than ever before. These sophisticated, sharp but smooth 18 statues are believed to be the original followers of the Buddha whose emotions represent for joy, love, anger, and sadness. 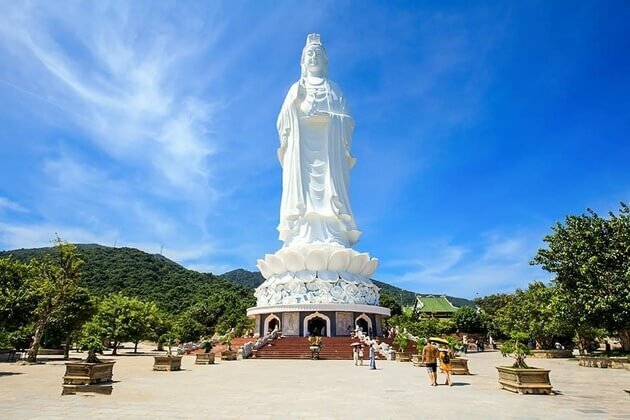 Being the tallest statue in Vietnam (220-foot), the Buddhist Goddess of Mercy – the Lady Buddha statue can be seen even you are very far away. 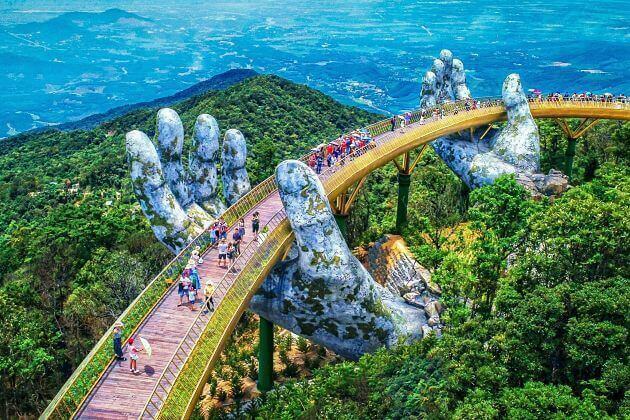 Standing up in the top of the mountains will give tourists a breathtaking scenery which is absolutely different from the view in the cruise ship of your Da Nang shore excursions. 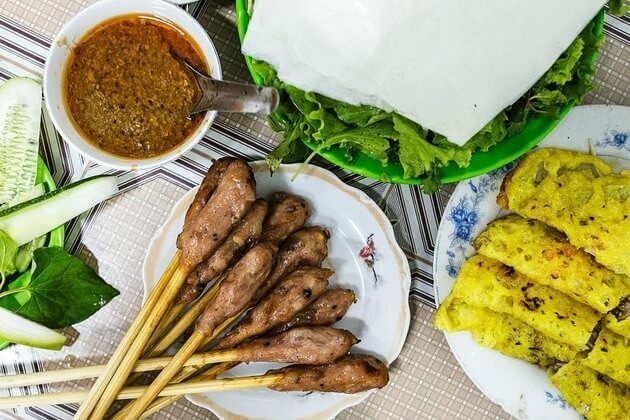 Even though Da Nang shore excursions are famous for various extraordinary beaches, some of those also being regarded as one of the most beautiful beaches in the world such as Non Nuoc Beach; many tourists come to this lovely city just because of Da Nang’s street food. Just forget about the beach and use your wallet for eating is enough! My Quang or Quang noodles is definitely the first dish you should try first when you come to Da Nang. Why? Because it is truly the representatives for the original taste of Da Nang. Besides, Banh Xeo (Sizzling Crepes), Bun Cha Ca (Fish cake noodle) or Oc Hut (Da Nang spicy snail) are also highly recommended. Furthermore, you will regret if you visit a by-the-sea city without trying its seafood. When you are in your Da Nang day trips from Tien Sa port, it is totally easy for tourists to see a wide range of fishermen who are going fishing. So you don’t need to worry about how fresh the seafood is. Just go to a seafood restaurant along the beach, choose your favorite live seafood, and you can see how your fish will be served. Your only concern is that your wallet is thick enough to let you try them all or not. Crab in tamarind sauce, grilled and steamed clams are some must-try dishes. 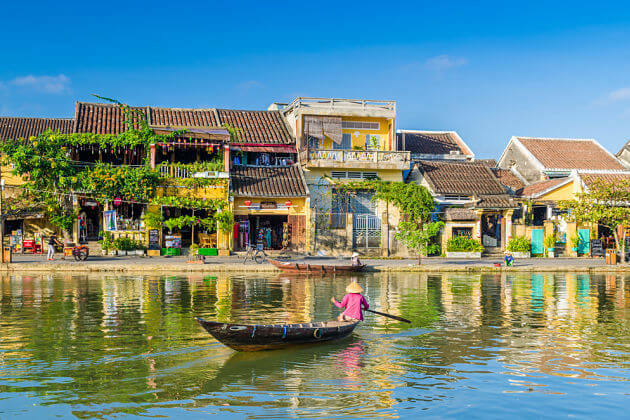 Vietnam is so proud of their unique heritage site – a well-preserved example of a South-East Asian trading port dating from the 15th to the 19th century – Hoi An Ancient Town. If the Imperial Citadel and Forbidden city evoke everyone about Hue, Hoi An Ancient Town is definitely the representatives of Hoi An day trips in particular as well as Vietnam in general. As mentioned above, the things make this small town unique because it reflects a fusion of indigenous – Vietnamese and foreign cultures which mainly from Chinese, Japanese with later European influences. Comprising 1,107 timber of frame buildings with brick or wooden walls such as architectural monuments, commercial and domestic vernacular structures, an open market and so on, Hoi An is absolutely an outstanding material manifestation of a cultural mixture international commercial port. 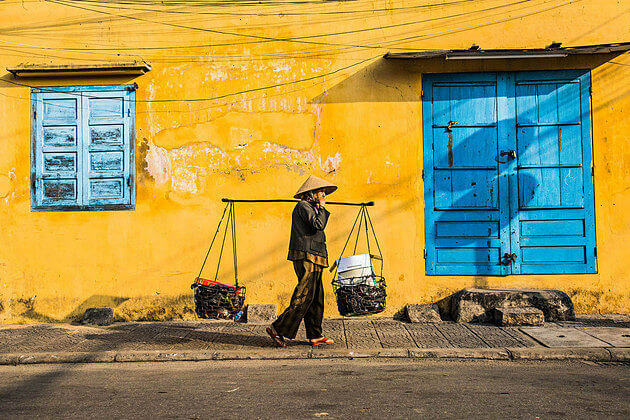 You have to travel about 30km for Hoi An day trips from Da Nang city, and even longer time, even further distance to travel from other countries to Vietnam; there is no reason for tourists not to visit this unique small town especially for those history-lovers. 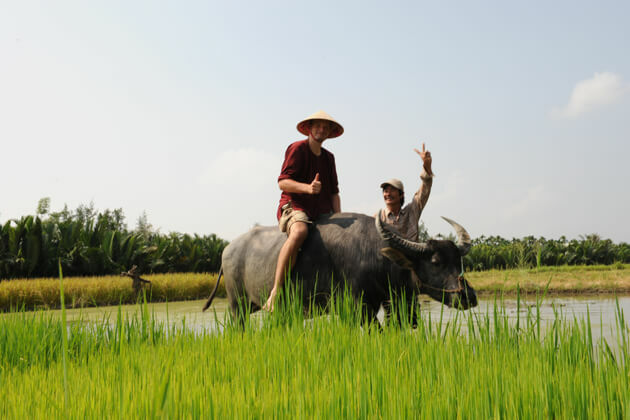 It is such a good new for natural lovers when going to Hoi An shore excursions from Tien Sa port, you are offered the Hoi An Farming and Fishing Eco tour. It is such a good chance for tourists to experience the traditional method of local people on farming as well as go fishing on your own. You will never have to wonder about how the local people did farming in the past without any machines. Wearing traditional customs as well as a conical hat and plastic boots to get ready, tourists and his friend – a buffalo will do everything themselves from preparing the land for sowing to fertilizing the garden and so on, of course, with the guide of the experts – the local farmers. It will definitely a once-in-a-lifetime experience that you will never forget. After leaving Mother Land, tourists can meet their Ocean Mom one more time, her wave will take you out there to the river then you will have the chance to meet and witness local fishermen working by their traditional net fishing. You just need to enjoy your hands-on experience to know how they catch that fresh delicious seafood. Or you can even try to do it if you want to. It just takes about 15km by boat from Hoi An shore excursions to this Vietnamese Hawaii, you should never miss it. Used to be a Hong Kong-style colony, Cham Island or Cu Lao Cham is home of 8 islands locating off Vietnam’s central coast. As Hoi An, Cu Lao Cham is also a unique destination because it is the only region in Vietnam that the “cua da” (the stone crab) with violet and orange colored shells can be found. Along with this special creature, Cham Island attracts tourists by its diversity of fauna and flora of the archipelago and its religious monuments also. 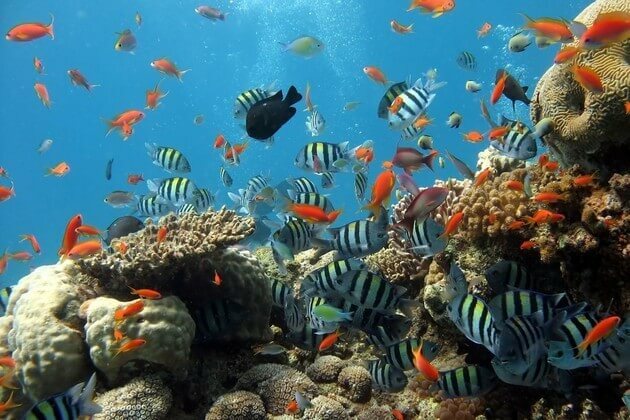 The area around this island is the home of 135 species of coral, 4 species of tiger shrimp and 84 species of a mollusk; many of which are listed in Vietnam and the world Red Book of endangered species. That is the reason why these days Cham islands are also a Marine Protected Area (MPA). Besides, Cu Lao Cham also famous for a temple which is the tradition for worshipping the whale in Vietnam’s central coastal areas began in the 19th century. Each island has its own significant feature such as Hon Lao – the largest island and Bai Lang – a traditional fishing village. Just a short distance for an interesting island, such a big deal to color your Hoi An shore excursions, why you don’t try? Da Nang & Hoi An shore excursions should be in your list-to-do when you come to Vietnam, maybe even on the top of your choices when you visit in the right season. Da Nang is a beautiful coastal city where you can soak in the cool fresh water for a swim in one of the most attractive beaches in the world. More than just white-sand stunning beaches, Da Nang shore excursions hide various attractions to see including the sacred My Son temples, known as the Angkor Wat of Vietnam, the magnificent Marble Mountains, French-style Ba Na Hills and don’t miss tons of interesting activities to experience in this beachside city. Just in the slightly south of the city is Hoi An. 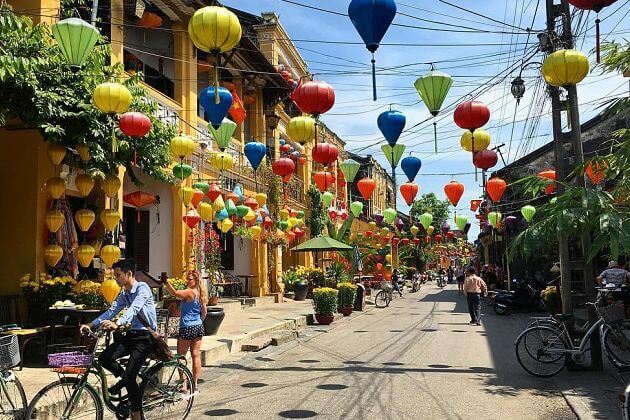 Hoi An Ancient Town is well-known worldwide for the old-fashion vibe revealed in the colorful silk hanging all over the streets, traditional architecture of temples and bridges, local experience in Tra Que vegetable village, and so on. The tropical monsoon climate with mild temperatures throughout the year is the kind of weather that you will experience in Da Nang and Hoi An shore excursions. The cities commonly have two seasons: wet and dry. The dry season lasts from April to August, while the wet period runs between September and March with the temperature ranging from 18°C to 34°C. The best time to enjoy Da Nang & Hoi An shore excursion is from February to May when the sky is clear with sunshine and low humidity level. A sightseeing city tour on foot or by taxi is recommended when the rain rarely falls. Sunbathing under the sun is also a wonderful experience with the average temperature on the beach is 25°C. The wet season in Da Nang & Hoi An starts in early October and leaves when March coming. Heavy rainfall occurs making the cooler temperature over the city. The weather is not too discomfort with heat that the average temperature is around 26°C, but the rain will pretend visitors from taking part in outdoor activities and also enjoying the beach due to cold and billowy sea. The coolest time of the year is between November and January. Don’t quickly think that the weather is nice for traveling, during this time, the area is dominated by typhoon causing thunderstorms and bad floods. We do not recommend the wet season if you want to hop on Da Nang & Hoi An shore excursions. However, if you are keen on visiting, remember to check the weather forecast beforehand. The dry season in Da Nang & Hoi An shore excursions lasts from January to September with really hot temperature and high humid. The temperature usually ranges from 26°C to 35°C (79°F - 95°F). In the daytime, sunshine always comes with harmful UV that sunglass, hat, and sun cream are highly recommended to avoid the heavy heat. The peak time of hot temperature is from June and August. As said above, the best time to visit Da Nang and Hoi An is from February to March when the weather is nice and mild. The temperature is not too much, fluctuates between 20 degrees to 27 degrees Celsius. 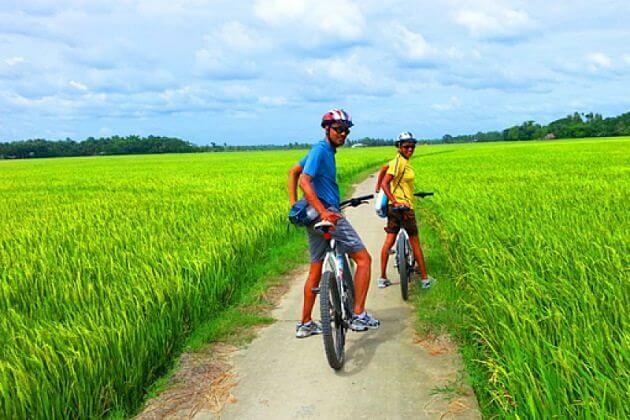 This is the perfect time to enjoy every kind of outdoor activities from relaxing on the beach or adventurous trekking. However, it is also the peak time of tourism that the beach can be full of tourists. The temperature starts to rise in the middle of April and reaches its peak in June to the end of August. The high humidity at the end of the season increases the discomfort when traveling.